Energy-savvy consumers have been buying and using compact fluorescent light bulbs for years already, but what if there were an even more energy-efficient way to light our homes? 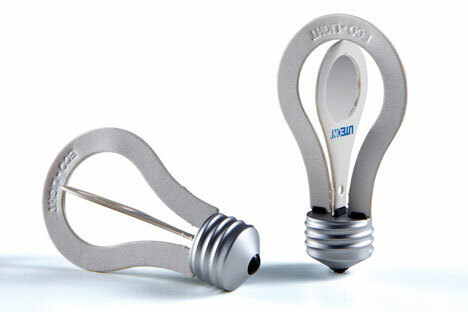 The Liteon Eco Light concept from Tien-Ho Hsu is a revolutionary redesign of the typical rounded bulb. 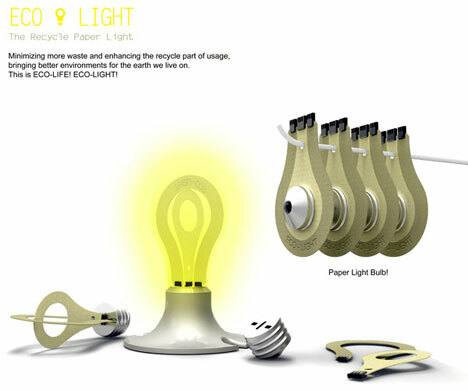 Made of paper and meant to ship nearly flat, the Eco Light bulb works by coating paper with a special conductive emulsion. When electricity is applied to the emulsion, it glows as brightly as a conventional light bulb. 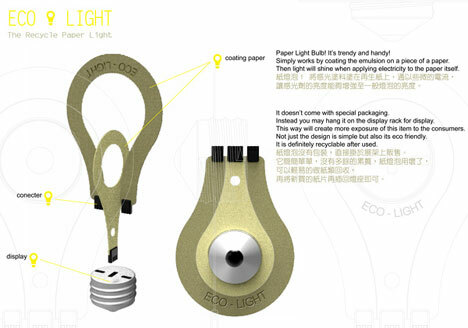 The Eco Light would be shipped to stores without exterior packaging. Each bulb has a hole that allows it to be hung up on shop displays. When the buyer gets it home, the bulb is assembled with a few simple twists and clicks. And when the bulbs burn out they can be tossed into the recycling bin with all of the other paper. See more in Unbuilt Concepts or under Technology. November, 2011.